Tallinn passenger and car ferry ticket prices, timetables, ticket reservations and information for ferries sailing from Tallinn to Helsinki, Mariehamn and Stockholm. Compare all available Tallinn ferry ticket prices in real time and book the cheapest available Tallinn car and passenger ferry tickets sailing to and from Tallinn, Helsinki, Mariehamn and Stockholm with St Peter Line, Tallink Silja or Viking Line Ferry ferries online with instant confirmation. Book Tallinn Ferry Tickets with St Peter Line, Tallink Silja or Viking Line Ferry for ferries sailing from Tallinn to Helsinki, Mariehamn and Stockholm online in advance to enjoy the cheapest available ferry ticket price. The price you see is the price you pay. There are no hidden extras or surprises such as added fuel surcharges or booking fees and we do not charge you anything extra for paying with a Visa Electron card. The price we quote you for your selected Tallinn passenger or car ferry ticket, onboard accommodation and vehicle type is all you will pay, and that's a promise. To obtain a Tallinn ferry ticket price and book your ferry ticket securely online please use the real time ferry booking form on the left. You are also able to add a hotel at your destination, or anywhere else, to your ferry ticket when completing your ferry ticket reservation. With a marvelous concert followed by two spectacular fireworks at New Year´s night, Tallinn became the official European Capital of Culture 2011. At the same moment Estonia converted from kroon to euro and is became the 17th Euro member in the European Union. A sea cost capital, a rare jewel in the north of Europe in the Gulf of Finland, that’s Tallinn. With one of the most completely preserved medieval cities in Europe it is a precious city on the UNESCO World Heritage List. Once a medieval Hanseatic town and for long periods in history dominated by the Germans, Swedes and Russians, Tallinn today contain lots of influence from those days but still manages to retain an Estonian soul and identity. This is not a huge capital, the population of Tallinn is just over 400,000, but it has it all. A very rich cultural and pleasant atmosphere, and many interesting sights yet to be explored. Tallinn is an important Baltic seaport with regular scheduled passenger and car ferry services from Helsinki, Mariehamn and Stockholm operated by St Peter Line, Tallink Silja or Viking Line. Tallinn is a modern city with extra ordinary business, telecom and Internet solutions. Tallinn is a unique mix of the very old and of the very modern. The city woke up from a more than fifty yearlong sleep behind the iron curtain to its birth of independence on the 20 of August 1991. Since then the city has grown in a tasteful and modest way. There are a lot of historical buildings to explore as well as beautiful parks and sights. A lot of interesting buildings remain from the Tsarist period in the exiting Tallinn history. Tallinn has historically consisted of three parts, and it can be useful to keep this distinction in mind while visiting the town. The historic centre area is now divided in so called Lower Town (with the Town Hall - Raekoja plats – and the landmark of Tallinn – the sky high St. Olaf´s Church) the and The Upper Town with Toompea Castle and Tall Hermann’s Tower. The Toompea (Domeberg), called also "Cathedral Hill" became the seat of the central authorities: first the Danish captains, then the komturs of the Teutonic Order, later Swedish and Russian governors. Until 1877 Toompea was a separate town (Dom zu Reval), the residence of the aristocracy; and today it is the seat of the Estonian government, as well as many embassies and residencies. The mayor tourist attractions of this part of town are the Castle (Castrum Danorum), along with two cathedrals – one Orthodox and one Lutheran. The Old Town, which is the old Hanseatic town, had its own, separate from Cathedral Hill, administration until the late 19th century. It was an important centre of the medieval trade in this part of Europe, on which it grew prosperous. The Town Hall - Raekoja plats – and the landmark of Tallinn – the sky high St. Olaf´s Church, along with the towers and town walls, are among most popular tourist attractions there. Ethnic Estonians replaced the local Baltic Germans as the majority amongst the residents of Tallinn first approximately in the middle of the 19th century. Estonians settled south of the Old Town. In Kadriorg, about 2km east of the centre, there is another - besides the Nevsky Cathedral and St.Nicholas’ Orthodox Church - remnant of the tsarist Russia that ruled Tallinn during two centuries. The summer residence of tsar Peter the Great, a magnificent, extravagant palace, is a very good example of the northern Baroque. Today it houses a part of the museum of modern art. Best Price Guarantee - We always offer you our lowest available St Peter Line, Tallink Silja or Viking Line Ferry passenger and car ferries ticket price to and from Tallinn. There are no hidden extras or surprises such as added fuel surcharges or booking fees and we also we do not charge you anything extra for paying with a Visa Electron card. The price we quote for your selected Tallinn ferry ticket, onboard accommodation and vehicle type is all you will pay, and that's a promise! In the unlikely event you find the same all inclusive Tallinn ferry ticket cheaper in the brochure of any other tour operator we promise that we will do our best to beat that price or offer you the choice of requesting a refund. 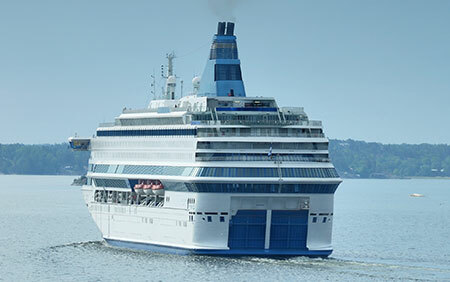 To book Tallinn car and passenger ferry tickets please click here. At ferryto.co.uk you are able to obtain live Tallinn ferry ticket prices, check availability and book car and passenger ferry tickets to and from Tallinn at our lowest available ticket price. Ferryto.co.uk is part of the world's largest online ferry ticket distribution network providing the ability to book over 80 major European ferry operators including to Tallinn and to over 1,200 other ferry routes throughout the UK, France, Spain, Ireland, Holland, Eastern Europe, the Mediterranean, the Baltic and North Africa.